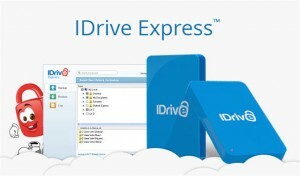 IDrive Express: Hard Drive Upload/Restore – Included For Free! The purpose of IDrive Express is to eliminate one of the biggest hassles of starting a cloud storage account: the initial upload of data over the internet, which even for an individual can top 100GB of information. IDrive Express covers you or your business up to 1TB (Terabyte, 1000 Gigabytes)! This initial upload, before IDrive Express, can take forever, killing your internet speed until it finally finishes. Of course during that time, any files yet to be uploaded aren’t protected! Then, the program has to go about making changes to files that have accumulated (unless it’s really intelligent and manages that during the big upload) – that can take more time and bandwidth. Some companies have offered an express upload/restore via hard drive feature for some time, but they charge sometimes several hundred dollars for it and often did not include a hard drive big enough (you have to use theirs) to cover all of your data – especially in the case of a business. IDrive Express is free, once per year (either upload or restore) for an IDrive Pro account. Business accounts it’s 3 free transfers per year. Any additional transfers are just $59.95. This includes free return shipping. How Does IDrive Express Work? Performing an initial backup using IDrive Express is a simple 4 step process and can usually be completed in one week, and none of your internet bandwidth is consumed. 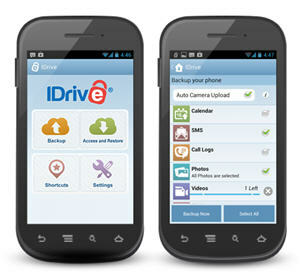 IDrive does the rest, securely storing your data in the cloud! Should you need to restore your data in a hurry after a disaster has struck, simply request the drive – with your encrypted data – and restore to your computer with the IDrive Express Application that you can download quickly off the web. Will IDrive Express Backup Mapped Drives and External Drives? Two of the features that initially attracted us to IDrive a long time ago was it’s ability to backup your external drives AND mapped drives to the cloud. This feature set is represented in the IDrive Express application as well. Is IDrive Express Available Everywhere? Unfortunately, IDrive Express is currently only available in the U.S.
Don’t Have An IDrive Account? There’s no better time to get a free IDrive 5GB account and start trying out their service. The 5GB free account lasts for LIFE, it’s not a limited time trial. IDrive Express is only available, though, if you upgrade to a paid Pro or business account – but IDrive is VERY affordable. IDrive has been constantly improving their online backup service and enhancing the usability of the mobile apps that go with it. Now their hard work is being recognized in the form of a PC Magazine Editor’s choice award and 4 star rating. The reviewers found IDrive, especially on the tablet app, to be be simple, clean and easy to use. One of my friends on Facebook just posted a quote the other day with the message the technology is best when you don’t recognize it – it just works. Isn’t that what you want in a backup solution, for it just to work? How many people go around saying they spent their morning “working on computer backup”? Who would want to spend time on that? You want your online backup or cloud storage provider to offer a service that installs easily, configures intuitively and then works silently in the background. Then, should disaster strike, you want it to be simple, quick and efficient to get your data back and be up and running then. 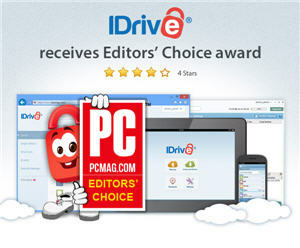 IDrive has obviously succeeded at that, as acknowledged by not only PC Magazine but also USA Today. 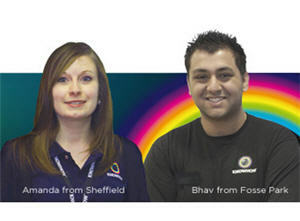 Find out for yourself how simple, efficient and inexpensive an IDrive account is. The new IDrive Online Backup One Touch backup and restore app makes it so easy, with just a single touch, to store all of your mobile data in your IDrive account in IDrive’s secure cloud. For smartphone users, IDrive has made it as easy as it can possibly get for you to quickly and securely backup and restore your mobile data. With just one touch, all your photos, videos, contacts, and calendar events are backed up without interrupting the use of your phone for other purposes. While this works on iPhone and Android, Android backup also works for call logs, apps, SD cards, and SMS messages. Turn on the the Auto Camera Upload feature and any pictures or videos you take with your smartphone will be automatically, seemlessly uploaded to your IDrive cloud. The only disadvantage here is that with videos and data plans there could be a conflict. Would be nice to have a WiFi only option on videos; I’ll look into it. Like other IDrive applications, the IDrive mobile app allows you to select what data you want backed up and what you don’t; you’re still in control. We are excited about the new IDrive mobile app primarily because of its cross-platform and cross-device capabilities. These new features make IDrive the only cloud storage provider that allows you to backup your contacts and photos on one platform, such as your iPhone, and be able to restore them to your Android tablet (or vice versa). You don’t have to be part of the iPhone vs Android “war” anymore! Learn more about IDrive and the new One Touch mobile app. The best online backup small business software is quite possibly the one that best approximates the offline backup software you (hopefully) have been using. Small business backup software is a mission critical component of any going concern that relies upon in house data, so the feature set we are looking for is more likely to be clear and easy to use include/exclude filters and top notch reporting, rather than, say, drag and drop capability. Businesses SHOULD have all of their data carefully segregated onto drive systems protected by RAID and clearly delineated from program files and operating system components. This not only helps protect the data but makes it much easier to determine exactly what needs to be backed up and how much space it will take. Further, small business data is likely to be stored on a dedicated server or NAS device that is often not supported by run-of-the-mill online backup software. One key element of the small business backup regimen online or offline is that the Server(s) should be running the backup software itself, not a workstation. If the business data resides on a NAS device then that may well not be possible. The reason we want to do this if possible is because the server SHOULD be operating 24/7 with battery backup; thus, never missing a backup simply because the power went off overnight. Servers also typically have some level of access control to prevent a novice computer user from doing something that would interfere with the backup running as scheduled. This makes reporting all the more important as there is not going to be reliance on some message on the screen to alert the responsible employee of a backup failure, or the mention of success. Quality online backup business grade software will send emails to multiple recipients ensure backup success or failure is noticed in a timely fashion. While all business data should reside on a centralized server, workstations may have configuration data and productivity tools that benefit the business to have backed up in the event of hard drive failure on that workstation. The online backup service, centrally managed, should allow for that but also provide the quota protection needed so that a large video file or other data block does not cause the company lost bandwidth during backup (to a degree) but also prevent the company from incurring additional cloud storage costs from inadvertently backing up unnecessary large files. Have basic backups of both Windows and Mac workstations can speed re-deployment of replacement hard drives or entire workstations. Not having to pay extra for this feature is all the better. Data Archiving is storing data in the cloud that no longer resides on physical servers or workstations in the business enterprise. Some companies may generate lots of PDF files, for instance, and either be required to keep them for X number of years or simply want to for potential future reference. Archiving is the process of uploading them to the business online backup account and then deleting them from the local data drive, typically to free up space and possibly improve server performance marginally. Naturally you would only want to do this with the best online backup vendors who have been around a long time and are expected to stay in business! Since this data can be quite large, you don’t want to have to pay excessively for that storage allocation. Since time is money and bandwidth is limited, an initial backup with physical media – typically a USB drive – is a nice feature. Having the ability to restore data this way via a USB drive overnighted to you could be critical in recovering your business from some type of disaster. Having your online backup software run constantly for 10 days for the initial backup may be tolerable, but waiting 10 days to get it all back probably is NOT! While we continue to evaluate new business grade cloud backup solutions, our testing has show so far that SOS online backup small business plans offer the qualities we are looking for as described above. 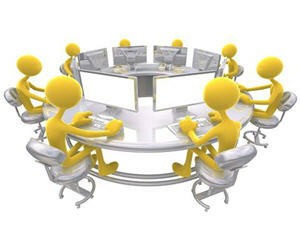 SOS has been the choice of many IT professionals, consultants and backup contractors for a long time. The software is solid, the company reputable, the feature list expansive. Don’t let your company’s data be at risk any longer. Check out SOS Online Backup small business plans now! One of the benefits to IDrive online backup service over their competitors is the option for a private encryption key that only you know. That means they can’t give it to you if you lose it, but it also means they cannot access your data or turn over unencrypted data to anyone else for any purpose. In order to use a private encryption key over the default key, though, you have to specify that when you create the account. Since these cloud backup services are changing (hopefully improving) all the time we often setup new test accounts. And since IDrive just made some changes for the better recently, and they have been our top pick for online backup, we figured it a good time to do it again. When you sign up for a free IDrive account (5GB forever, they’ll add 0.5GB just for installing the desktop app and a paid account is easy and inexpensive to upgrade to) they give you some helpful hints on what they are looking for in a username and password. 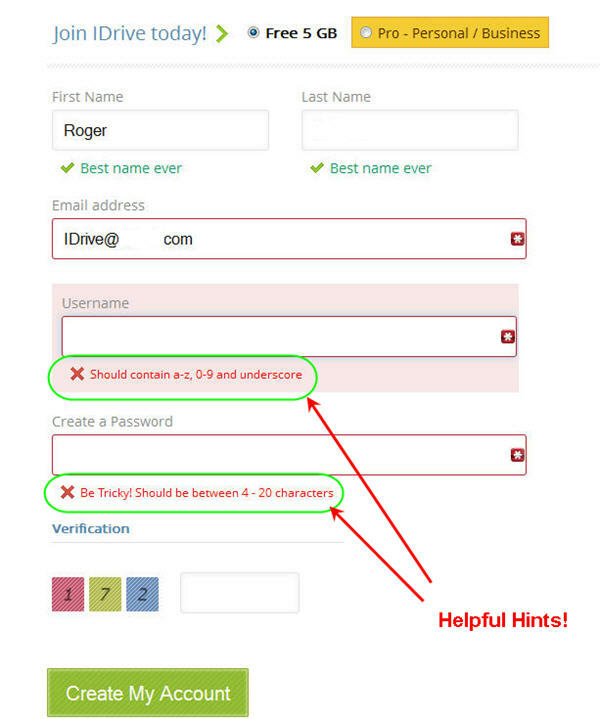 Note: You won’t see the username prompt unless you have already used your email address for another IDrive account; they’ll use your email as your account username, but you can change your email address at any time. So as you can see from the larger image at right, IDrive will tell you what you do wrong if they don’t like something about your username and password. Unfortunately, when you go to select your private encryption key, that’s not the case. Unless, of course, they have taken my advice after both an online chat and a phone call with them yesterday and added the helpful text. Just because someone creating an IDrive online backup account wants a private encryption key doesn’t mean they are doing anything illegal, immoral or otherwise attracting the attention of the NSA. Face it, getting their attention only requires you to be a U.S. citizen and I’m not sure you even have to be living and breathing! The problem is that we have all heard too many stories of companies screwing up, some rogue employee selling some data, or the ubiquitous “stolen laptop” with unencrypted data on it that had no business leaving the office anyway. The reason you want a private encryption key with IDrive can be simply because you are prudent and cautious. You lose the key, the data’s unusable. Only a problem when you go to restore, one reason we suggest TESTING a restore often. Keep the key in a free Password Safe or free cloud based utility like LastPass. 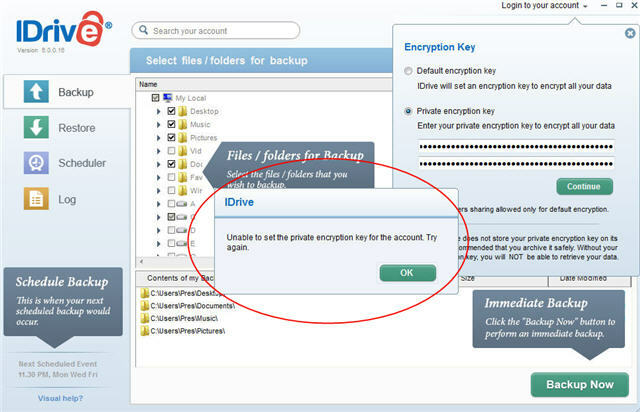 Sharing of files and folders with others is not possible if you use the private encryption key with your IDrive account. Well, if it’s data you don’t want anyone else to have access to then maybe you won’t be sharing much? The thing they don’t (currently) tell you at IDrive when setting up your private encryption key is that, while there apparently is no length limit on the key, SPACES ARE NOT ALLOWED! Not only is there no helpful hint to tell you that, but if you include a space, like with a pass “phrase” you might be inclined to use, the error message will indicate that a private encryption key “cannot be set” on your account when it should just say “no spaces allowed”. IDrive online backup re-cemented its place as our #1 pick for cloud backup with its recent upgrades; and we do like (and use) the private encryption key option. Just know what is allowed, make sure you can type it on a mobile device if you use those apps and remember that you must decide when you create the account if you want to use the private key option – and there is no going back. Pick up a free, forever 5GB (5.5GB if you use the desktop app) account at IDrive, knowing you can easily upgrade if you need more space at VERY reasonable prices. IDrive online backup service has been a favorite of ours for a long time and only recently came up with a problem that prevented us from recommending it in certain circumstances. Well, probably because of us (just kidding) they have redesigned their software, added some real cool functionality like a combined account and greatly improved their mobile Apps! To top it off, how about a 20% off coupon code for IDrive? With IDrive you can backup unlimited devices to a single account and choose how much storage you want to pay for, at VERY reasonable prices – starting out at 5GB for FREE. Forever. IDrive maintains 30 previous versions of your files and never deletes anything; you can delete old files for sync your account to your computer with an “archive cleanup” but THEY will never delete your data. What Is LiveDrive KNOWHOW Cloud? We get a lot of queries about LiveDrive KNOWHOW Cloud and wonder how it differs from LiveDrive cloud backup service, if they have to be in the U.K. to benefit and if we recommend it for online computer backup. The good news is that, while KNOWHOW seems to be a top rated tech solution provider in the U.K., the cloud backup is really just the same LiveDrive cloud backup you can get anywhere and try out for 14 days – free, no credit card – by clicking here. It seems that these tech support folks in the U.K. were just looking for one of the best online backup vendors to partner up with so they would have a good backup solution to recommend to their customers and chose LiveDrive. LiveDrive is based in the U.K. though that’s no reason for U.S. based customers (or other parts of the world either, even Japan) to not take advantage of their unlimited online backup, with no file size limits or bandwidth throttles for an easy, low price. While we really don’t have any connection with the KnowHow people to know whether or not they specifically recommend the basic LiveDrive unlimited backup package, the Briefcase (computer syncing) package or the Pro Suite (which combines both, for up to 5 users) all that really matters is that you get YOUR data backed up. The fact that LiveDrive KnowHow Cloud is a well promoted solution by reputable people should just give you some real confidence in the company that you will be trusting your data to when you sign up with LiveDrive. In the end, the bottom line is that you want your data stored in the cloud with someone you can trust, a company that has FAST access to their servers from your PC, and people to support you should you encounter a problem or have a question. The fact that they offer one of the least expensive unlimited cloud accounts is just a bonus. And no, you don’t have to be subject of the Queen, or be a customer of some certain company. You can start your own evaluation of LiveDrive for 14 days, for free, by just heading over to the LiveDrive website now. I’m not sure why so many online backup vendors do not support NAS drives, network connections of any kind and many even will not backup an external drive. Zoolz does all three. We have been working with Zoolz for a little while now and really do like what we see, though it’s not a “discount” offering – but sometimes you get what you pay for. The ‘green dot’ indicating that a file is backed up does work either way, but only if you are viewing the file using the same method it was backed up (UNC or mapped drive letter). Zoolz has introduced the concept of “cold storage” whereby you can get lots of storage inexpensively but access is delayed for a few hours when you need to restore. This can be perfect for NAS drive cloud storage since you may well be backing up, say, an entire music or video collection that – hopefully – you never will need to restore anyway. And if you do, a few hours won’t make any difference as you may likely be restoring A LOT of data anyway if you are recovering from catastrophe. We are still working on our full Zoolz review but I can easily say at this point that unless customer service proves to be a disappointment it will likely end up high on the recommended list for those who can afford the higher cost. Quality is not usually cheap. Zoolz has a cloud storage plan to meet your needs whether for home or business (click the appropriate one for more info). Have You Thought About Your Data In The Long Term? Will Your Digital Memories Just Fade Away? One of the things I was cognizant of when working as a Small Business IT Consultant was the limitations of computer backup. This was mostly before the era of cloud storage (previously referred to as online backup). My clients had archived backups. We could go back in time month by month for 1 year (end of month backup tape saved), then year by year (end of year backup tape saved) instead of the often standard approach of just rotating so many disks, tapes or other backup media. Many in IT just “didn’t get” that data could be accidentally deleted, ruined, corrupted by hardware failure or malware and not get noticed until AFTER the backup media cycle had gone full circle. Hence, the reason we saved backups from each month end and year end. Once data became too large for reasonably priced tapes there was a push to go USB hard drive. Nifty, but very expensive to maintain archives. With home users, there typically just wasn’t much of a backup. People would (and still do) lose data all the time. As hard drives got larger and less expensive it happened more often because these “cheaper” hard drives were lower quality, sourced overseas to the lowest bidder. Unfortunately, that coincided with people shifting from printed photographs (and memories) to digital ones. Even video cameras stopped using tapes and went to hard drive or SD card. Personally, I always liked tapes because once “ripped” to your computer you always had the tape as a “backup”; that is, as long as you had a working device to play it on. With VHS and VHS-C (with an adapter) that was easy for a long time. The smaller mini DV tapes, though, were popular for a shorter time period and if you have a bunch of those without a compatible device to play them on, they aren’t of much use. Chances are, though, you could probably find a video or data recovery service that could – for a fee – restore your digital memories to a media that you can access. New devices, using SD cards that you rip and then re-use, demand that you start thinking about long term data storage and preservation if you want to enjoy those memories years from now. My generation and maybe a couple of generations on either side might remember – often at a relative’s passing – going through a box of old photographs at some point in their lives. Those old photos can reveal information about people that you never knew; maybe for better, maybe not. But will future generations have those boxes of old photos to dig through and wish there were more legible details penned on the back? For instance, take a family where dad could easily be classified a firearms “nut”, never too far away from the field of law enforcement, whose own child wants to be a cop and whose one nephew leaves a career in business to join the State Police and his other nephew works on motorcycles for a living. This dad never knew his grandfather well, he was a quiet man – a retired factory worker – who died when the dad was young. But an old photograph of his grandfather, in a box of photos out in another relatives garage, shows a young State Police motorcycle cop front and center holding a Browning hi-power automatic in front of a line of other officers all holding revolvers. The grandfather lost his job on the State Police because the governor’s office of a notoriously corrupt state changed political parties and that’s how things worked back then. That one photograph seems to connect a lot of dots. The millennial generation seems to take about everything for granted and do zero planning for the future. They snap a photo today and give nary a thought to how or where that photo will survive digitally (not sure they even know it can be printed) for decades to come. They probably know what “syncing” is all about, but how about “archiving”? I have thought about this a lot recently as we have moved and had to “downsize” a couple of times in order to get everything from our custom built house with a basement and storage galore into a house in an area where everything is designed and built “by morons, for morons” without much real thought or planning; it’s all about being able to “tick the checkboxes” on a real estate form and getting that cost per square foot down. Idiots. 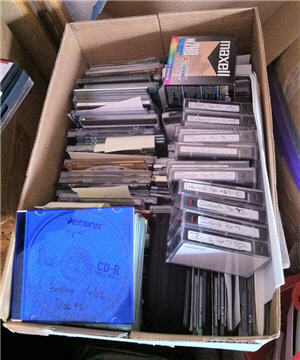 For less years than it seems I have had servers to store my data on, and only recently digitized all the old non-digital home videos we took (and seldom ever watched, never watch anymore). As our kids marry and leave the house, though, I wonder what they will do with data that’s important to them – if in fact any of it is deemed important by them. At this point in their lives they don’t seem to care too much about childhood things, and that’s probably good. The question is, will that change when they have families of their own – and memories fade? What Types Of Data Do You Have? One of the toughest things I do in my online business is try to put myself in other people’s shoes and see things through their eyes. Anyone who knows me will tell you that I am not exactly “average”. I have all types of data; but heck, I’ve owned my own business, done my own taxes and created lots of digital content. What kind of electronic “stuff” is important to you? As I stood over a shredder and a fire for hours & hours at a time during our move it was readily apparent to me that I had to make the switch to paperless records. What has to be stored? Where will it be stored? What “redundancy” (backups) must I have? And then there is the more “permanent” data, the photographs, videos, etc. that we want to keep maybe even past our own lifetimes? During our move there were many things that were neat but I simply couldn’t keep everything. So I snapped a digital photo of it; now what? Where does that photo go? Then the tough part, what do you do with the item? Ebay & CraigsList are a huge pain and often unsuccessful. Some things MIGHT go as an antique but you could spend years hauling stuff around. So it’s either GoodWill, Salvation Army, the trash, or the fire. Sometimes easier said than done, especially if you are the sentimental type. Harder still when those items are from or remind you of someone now gone. Then what data do we have that we care about, and is it short term or long term? If you have any of the above, do you know where it resides so you could back it up/store it “in the cloud”? Why Do We Keep Anything? When one gets older, they get more philosophical; hopefully that’s wisdom kicking in. During the course of our move, we encountered many items we had not seen in years. Once seen, I couldn’t hardly bear to part with some items. Yet, if I had never seen them again, I wouldn’t miss them. Some things need to be thrown away but just not by me. I think our data is the same way. In some boxes in my old computer shop are installation diskettes of well loved computer programs. Some of those programs were tools by which my life was made easier, I made other people’s lives easier, and with some I made a lot of money that provided well for my family. Why is it hard to throw that stuff out? I even have tutorial books that taught me how to program – has it really been 30 years ago? Yes, all this rambling does have a point! I’m not just waxing nostalgic on you. Most people seem to choose their online backup / cloud storage vendor based on little more than price and a couple of key features. But in the process of reviewing new cloud storage vendor Zoolz, I came across these footnoted words of wisdom regarding choosing LIFETIME storage for your data. Here are 6 reasons why other (non-zoolz) solutions are not considered lifetime storage. If you don’t reconnect your external drives, your data after a while can get deleted. Your service can limit the number of external hard drives that can be backed up. Over the years you can accumulate more and will have to abandon your older ones to protect the newer. You KNOW you will either outgrow your USB hard drive, it will die, or you’ll convert to some newer technology. You KNOW you will upgrade to another computing device of some kind and probably a lot sooner than I will (my laptop is over 9 years old). You KNOW that you won’t think of all these things when you do make those upgrades and transitions. The first thing I want you to do is evaluate those 5 questions above. Then, consider a cloud service – maybe Zoolz (if you can get past the weird name…), and make sure you have a plan to preserve and protect your data for the long term and arrange lifetime storage for those data items you want to be around for future generations. We decided to take another look at SOS Backup Online (Business Free Trial – 14 day) since it had been a while and we have had some specific requests from clients to recommend the best small business online backup. The more online backup reviews we do the more we realize that there still is no one size fits all, perfect online backup software; each has it’s pros and cons and features that we really wish they would have and sometimes cannot fathom why they don’t. In the end, though, it’s all about having your data safely backed up in the cloud when you need it with a speedy restore process providing 100% accuracy of your file contents. Most everything else COULD be considered optional. First let’s start out with a distinction, every backup we tried in this SOS free trial was into the cloud, “online” vs “local”. And that is coincidentally our first finding we would like to report. 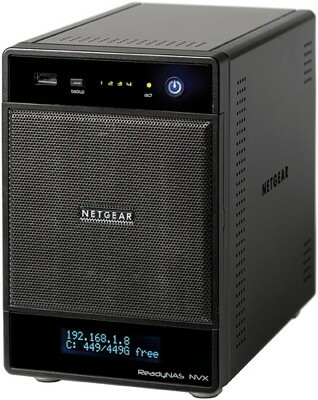 “Local” backup, ie backup to a hard drive or other USB or network device is becoming a must to many of our clients. Maybe it’s to speed the ability of large restores, maybe just for peace of mind. While SOS does not perform a local backup simultaneously like Mozy, it does allow you to separately configure and run backups to a local hard drive in addition to their server farm in the cloud. The testing we did was strictly to the cloud, but we saw no reason to believe that local backup is not just as solid. The backup file selection process was similar to many where they offer a wizard to find your files for you since, well, most of us don’t seem to know where our data resides. The initial scan with some mapped drives of remote server shares took a bit and could not stop it. But after that we were able to select “Do Not Scan” and do the file selection manually. Cloud backup of network drives couldn’t be easier or more full featured, something especially critical for business cloud backup. As you can see from the screen shot on the right, you do NOT have to map a network drive to backup online with SOS Business AND you get the opportunity to list credentials that the program should use if needed. 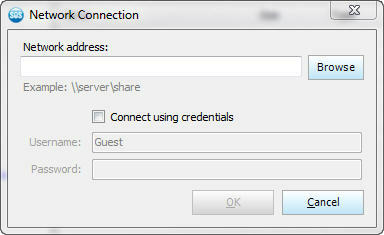 This feature makes unattended, even not logged in online backup of network drives so much easier and more fool proof. Many a user – using other products – has found out the hard way that scheduled backups have not been including files on a network share because of permissions issues. Just because you have authenticated access at the time of file selection does not mean it will automatically be there at backup time. 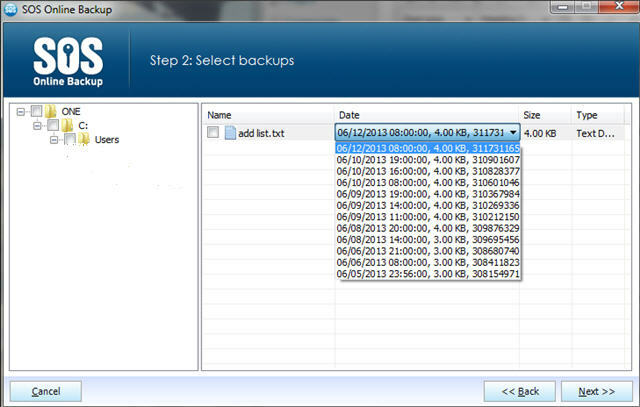 Local files are simple to select for backup so not much further needs to be said on that. Speaking of missing files in the backup, the old offline backup method was to check the scheduled backup reports that would be (optionally, recommended) emailed to a backup administrator listing summary and/or detail right down to the files backed up. Certainly, though, any files SKIPPED should be listed in the backup report with the error code at a minimum specifying why the file or database was skipped. With SOS backup online reporting can be emailed to multiple recipients but really doesn’t say much of value other than that a backup did occur. We reported more on this issue in a previous post. Since getting your data back from your small business cloud backup provided is the whole point as mentioned above, we were anxious to not only restore some files and compare them to the original but also check out the versioning feature. One particular file we had been backing up with our free trial account included a todo list of sorts that was changed frequently. We had scheduled backups running every hour to make sure we had plenty of versions to play around with. This feature to us, is awesome. Time goes by just too quickly to limit ourselves to 30 days, heck, we’ve put a project aside for more than 30 days and would have been ready to swear it was less than 3 weeks. So what good is an online backup solution where after 30 days all of your versions are, well, NOT history? Other cloud backup providers give you 30 versions and, while that sounds like plenty, if you have the backup set for “continuous” or “hourly” like we did with this SOS Business free trial then 30 versions might not take you back even 2 days! The unlimited versions do not fill up your space quota and cost you more money to rent more space. Only the original file backup counts against the space of your account. That’s a plus for you. The company saves your bandwidth and their server space by a process known as de-duplication and delta (or change) backup whereby they backup the changes in files, not the entire file each and every time. This does require some system smarts to get you back your data properly, but this is a time honed process by most EVERY player in the data storage and cloud backup business and it is come to be reliable. This saves THEM on server space (and their bandwidth) they otherwise could not afford. 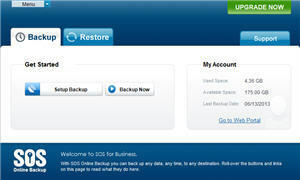 SOS backup online and local is an excellent small business cloud backup solution; and it’s almost identical to the SOS online backup home edition, so we highly recommend the company for both sets of needs. While they do have iOS and Android apps we just don’t see that need to much on the business side and if you are really into streaming media to your smartphone you would probably be better off looking at SugarSync. For multiple computers in a small business and cloud backup of network drives, servers, online backup for NAS devices, SOS is an excellent choice that will protect your data and give you the features you need to protect your data and restore it when necessary.